Published in the South Kent Gazette, 12 November, 1980. About the year 1864 the land on the eastern side of the road at Maxton was acquired by the Freehold Land Company. It was divided into plots and traversed by roads, two across, parallel with the main road, and two roads passing upwards to the boundary of the Government land of the Western Heights. Building plots were taken up by a few enthusiasts, but it was too far out at that time to attract many residents. In 1867 there were but sixteen houses on this new estate, and twenty years later, in 1887, there had been but twenty more added. By 1907 the estate, designed in 1864, had been practically filled up, having over 130 houses without counting those on the new estate on the western side of the main road. In 1933 an extension was commenced of Manor Road which was laid out parallel to Folkestone Road early in the century. On the slopes of the Heights parallel with Manor Road two other roads have been built, Farthingloe Road and Mount Road which are linked to Manor Road by a steep hill called Manor Rise. These have both been fully developed in recent years. Lower down Folkestone Road stood Maxton House, originally known as Churchill House and in recent years as Cosworth Manor. It was considered to be the first house in Maxton. This substantial mansion and the road to the rear, Churchill Road, have literary associations. Its first occupier, Mr Edward Foss, about the year 1865, rendered assistance to Mr John Bruce in compiling the interesting memoir of the poet William Cooper, which appeared in Messrs Bell and Daldy’s Aldine Edition. The next occupant was Major W. Augustos Munn, FRHS, who, for 35 years, was a co-worker with Dr Edward Bevan in studying the habits of the honey-bee; and having survived Dr Bevan and acquired the copyright of his standard book on that subject, Major Munn, in the year 1870, when residing at Maxton, published an enlarged and illustrated edition of that classic. Another literary link with this locality is the fact that the Reverend Thomas Russell, one of the pioneers of the Primitive Methodist Connexion, resided at Maxton from the time of his superannuation in the year 1876 until his death in 1889. He built Barnsley-Smith House, later renamed Tabernacle House, and Maxton Tabernacle on the land adjoining, and then re-wrote his Records of Primitive Methodism, and also memoirs of the two Bournes, his co-workers in the early days of Primitive Methodism. The housing development on the western side of the Maxton road is comparatively new. Prior to the last decade of the 19th century the extensive meadow under the side of Stepping Down was regularly used for Band of Hope and Sunday School festivals. Now it is covered with houses, intersected by Lascelles Road, Malmains Road, and Church Road. The two first named terminate on the margin of the meadow under Stepping Down; But Church Road has a right-angle in the middle, and ascending from Maxton Road to the point where it cuts the ancient Stepping Down path, then turns down into Elms Vale Road. In this latter half is situate the church of St Martin, for which a district was carved out of Hougham, the Reverend Arthur Jepson being the first vicar. Just beyond Maxton, before the road to Folkestone reaches open country, is situate the Manor Court Farm of Farthingloe. This Manor was held by the Canons of St Martin-le-Grand during the Saxon period, continuing in the possession of the Dover Priory until is dissolution; and afterwards went to the Archbishop of Canterbury. In a Dover Corporation deed dated 1385, the name was spelled “Ffarnynglo.“ The place in early times was called Venson Dane and Well Close. The names Farthingloe is supposed to have been derived from Matilda de Ffarninglo, who held it from the Prior in the reign of Henry III. Maxton, in its physical features, is attractive, seated as it is in the hollow of the western hills. To the east, is the bold range of the fortified Western Heights; and to the west, the Stepping Down range, which runs to the tableland of Hougham, supposed to be so named from its elevated situation, meaning “high village.“ Then again, to the north, Elms Vale runs between the deeply scored hills to the charmingly picturesque place known as The Elms. The Dover trams (1897-1936) had their western terminus at Maxton, from whence pleasant walks may be taken along the ridges, where the sea view is not surpassed on any part of the coast. All set for a day’s outing — to the races perhaps — about 60 years ago. Note the solid tyres and the gun carriage type wheels of the two open-top charabancs, one of them a Pullman, for this all-male party. One child also posed for the picture, sitting on grandad’s knee on the front seat. 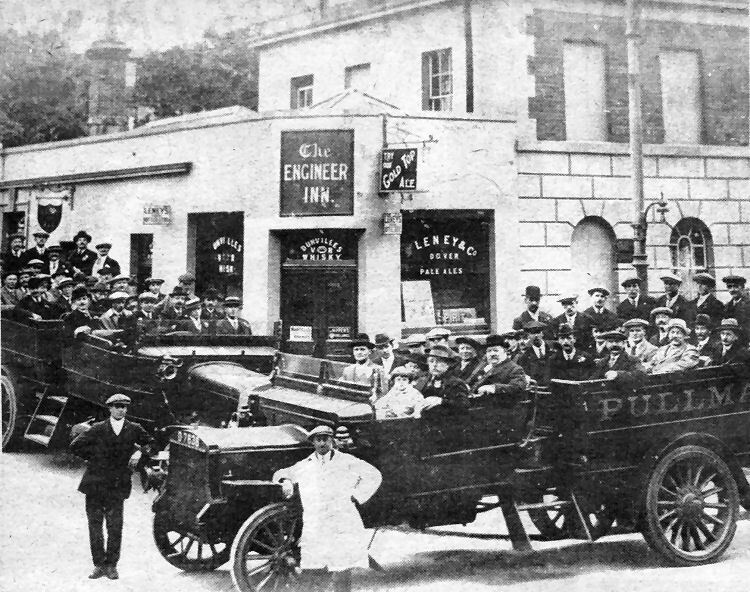 The buses are pictured outside the Engineer Inn, of which the men were presumably customers. Standing on the cornier of Folkestone Road and Malvern Road, the Engineer was on of many local public houses which used to sell the beers produced at Leney’s old brewery, pictured below, between Castle Street and Town wall Street.